Associations, continued. 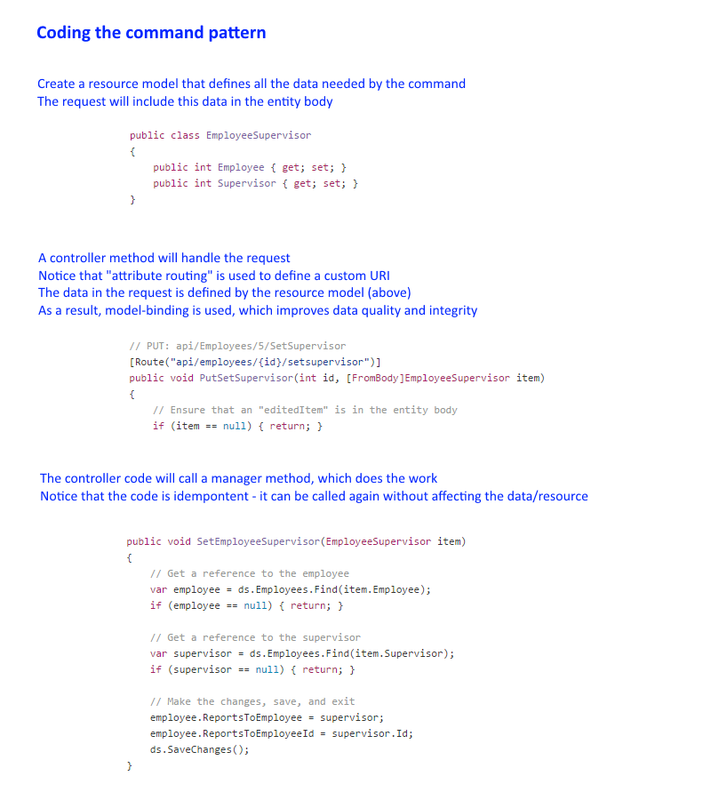 The “command” pattern. In your ASP.NET MVC web apps course, you probably had a reasonable treatment of associations. In the previous class session, we refreshed your memory about one to many associations. 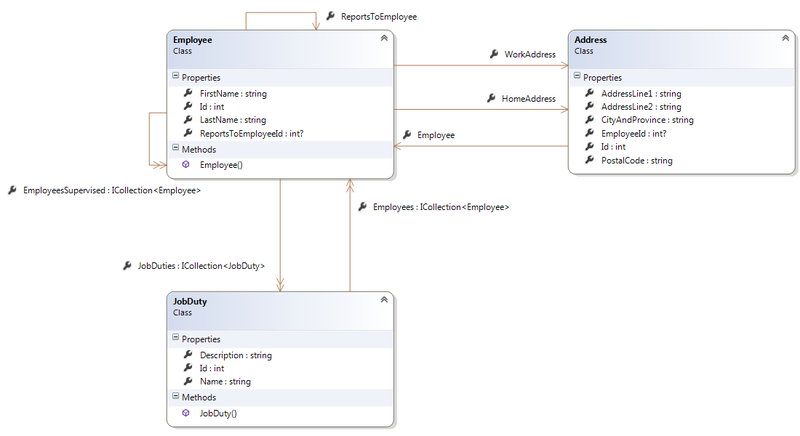 The class diagram below is from this week’s code example, AssociationsOther. Click to open it in its own tab/window. An Employee can have several ‘job duties’ (e.g. teacher, researcher, coordinator), and a ‘job duty’ is performed by many Employees (e.g. School of ICT coordinators include Peter McIntyre, Ian Tipson, Nagham Kubba, etc.). Maybe surprisingly, this is also actually easy. Simply add collection properties to each class, similar to a ‘one to many’ association. The biggest difference-maker for us is that we are writing web services and web apps. As a result, operations on data are atomic – a ‘read’ is done as a database server connection open, a read, and an immediate close. Similarly, a ‘write’ is done as an open, a write, and an immediate close. Many of the discussions in the linked documents (below) are for runtime environments where a database connection is persisted as a longer-lifetime object. So, if you have questions about syntax and differences with what you’ve learned so far, ask your professor. A web service is NOT intended to be simply a thin layer on top of a data store. Instead, it is intended to be a gateway to the richness of an application / problem / business domain – all of its operations and workflows. Today, you’ll get a gentle introduction to this concept. This will prepare you for more interesting scenarios in a few weeks. You can – and should – practice this concept in Lab 2. In HTTP, the GET method is ‘safe’. A safe method does not change the state of a resource. These methods are ‘unsafe’: POST, PUT, DELETE. We must also consider idempotence. In brief, a method is ‘idempotent’ if repeated execution has the same effect.